Equipo Nizkor - CRS R43071 - U.S.-Chinese Motor Vehicle Trade: Overview and Issues. The U.S. auto industry employs nearly 800,000 workers and is a major employer in certain parts of the country. International competition is fierce, with many automakers and thousands of parts makers vying for market share. Because of the industry's importance to the U.S. economy, the rapid rise of China's auto assembly and auto parts industries in recent years has raised concerns among some Members of Congress. In 2009, China overtook the United States to become both the world's largest producer of and market for motor vehicles. In 2012, assemblers in China sold 19 million vehicles, and forecasts project more than 30 million vehicles will be sold there in 2020. China's increasing importance in this industry presents a unique set of opportunities and challenges for the United States. On the one hand, China is in some respects a relatively open market; it was the fourth-largest export market for U.S. autos and auto parts in 2012 at $7.3 billion ($5.7 billion for autos and $1.6 billion for auto parts), and has welcomed foreign direct investment by U.S.-based auto and auto parts manufacturers. Every year since 2010, General Motors has sold more cars in China (through exports and its joint ventures there) than in the United States. On the other hand, China maintains a number of trade and investment barriers that affect trade flows in autos and auto parts. Foreign automakers can produce autos in China only through 50/50 joint ventures with Chinese partners. In addition, U.S. and other foreign auto firms have reportedly faced pressures relating to transfer of technology, export performance, and domestic content requirements. Although the United States imports few vehicles from China, China has become the fourth-largest source of U.S. auto parts imports, with shipments of $14.5 billion in 2012. The Chinese government has made the development of its auto and auto parts industries, including "new energy vehicles," a major economic priority, and has implemented a number of industrial policies to promote and protect Chinese auto firms with the long-term goal of making them globally competitive. As a result, auto and auto parts trade has become a source of conflict between the United States and China, most recently in 2012, when the Obama Administration asked the World Trade Organization (WTO) to consider whether alleged Chinese subsidies of auto and auto parts manufacturers violate international rules. China's demand for motor vehicles is likely to continue growing rapidly because its population of 1.3 billion is just beginning to have the financial resources to purchase automobiles. For the United States, this will mean many new opportunities and challenges. Unlike some other markets, such as Korea, China's large internal demand may well shape the industry for many years, with exporting a secondary interest. China's rising investments in U.S. parts makers such as Nexteer and B456 Systems may help develop a U.S. technology lead in fuel-efficient, low-emission vehicles. But the prevalence of state and municipal ownership of many Chinese auto and auto parts companies may also cause friction. Many in Congress have called on the Obama Administration to take a tougher stand against China's industrial policies that may favor Chinese automakers over foreign automakers. The U.S. auto industry is of interest to many in Congress because of its large employment, economic impact, and geographic reach. Around the world, there are many automakers and thousands of parts suppliers, leading to intense international competition. Through the 2009 stimulus bill |1| and financial support for General Motors, Chrysler, and their suppliers, the recovery of the domestic auto industry has been made a national priority. The federal government has also provided loans and grants for electric vehicle manufacturing operations, |2| research and development support for new electric, fuel cell, and natural gas vehicles, and federal tax credits for purchase of hybrid and electric vehicles. The rapid rise of China's auto and auto parts industries in recent years has raised similar concerns and led to questions about some of the trade practices employed by the Chinese government. Some in Congress have called on the Obama Administration to take a tougher stand against China's industrial policies and other measures that may be distorting trade, including by making greater use of the World Trade Organization (WTO) dispute settlement process to challenge Chinese policies that may violate WTO rules. This report examines the rise of China's auto and auto parts industries, Chinese government policies to promote these industries, trends in U.S.-China trade in autos and parts, auto-related trade disputes, and implications for U.S.-China commercial relations. Sales are expected to continue rising, as China's ownership rate of 58 motor vehicles per 1,000 people is half the global average of 175 per 1,000 people |7| and well below the U.S. rate of 797 per 1,000 people. A major project under way to build a network similar to the U.S. Interstate Highway system may also support sales growth. It has been forecast that as many as 30 million vehicles will be sold annually in China by 2020, with most of them being produced there. |8| Chinese production capacity is expanding even faster than demand, resulting in a drop in average vehicle prices at a time when personal income is on the rise. Such joint ventures between foreign companies and Chinese partners produce about 70% of new passenger cars sold in China. |13| GM and VW are the leading non-Chinese automakers, and China is also the biggest market (in terms of number of cars sold) in their respective global portfolios. Source: Ward's Automotive Database, released February 2013. Note: Includes passenger cars; sport utility vehicles; light, medium and heavy trucks. Source: BBVA Research, Automobile Market Outlook: China, Hong Kong, June 19, 2012, p. 4. With the rapid growth of the Chinese auto sector has come rising demand for the thousands of auto parts that are combined into final product motor vehicles. The Chinese parts industry is fragmented and comprises both Chinese and foreign parts makers, including many U.S.-based companies. 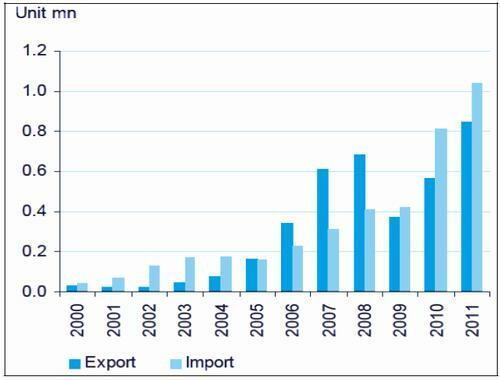 China's exports of auto parts grew from $7.4 billion in 2002 to more than $69 billion in 2011, a nine-fold increase. |30| According to U.S. government data, about 25% of China's auto parts production is exported, including to the United States, where more than $14 billion in parts from China were imported in 2012, a 60% increase since 2008. |31| As discussed later in this report, some U.S. producers and the U.S. government have alleged that many auto parts exports are subsidized in ways that violate WTO rules. China's most recent Five Year Plan, discussed later in this report, emphasizes production of "new energy vehicles," such as electric and fuel cell cars. Toward this end, the plan identifies electric vehicle batteries, electric motors, sensors, and electronic fuel cells as particularly important. Should China develop exports of such products, they would compete directly with more sophisticated parts manufacturing in other industrialized countries. China's auto parts sector is also being bolstered through the acquisition of assets of foreign auto parts makers. Through such purchases, Chinese parts makers can target technology and product innovations to enhance their Chinese operations. In addition, acquisitions may help the Chinese companies develop the expertise to shift from supplying low-margin parts to more profitable activities, such as integrating parts into component systems. Beijing West Industries (BWI), a joint venture of two Chinese state-owned enterprises, bought the suspension and brake units of Delphi Corp. in 2009 for about $100 million as Delphi was emerging from bankruptcy and shedding assets. |43| BWI operates former Delphi plants in Ohio and Michigan that make components for Chevrolet, Audi, and other automakers. The Chinese conglomerate Wanxiang outbid Johnson Controls and several other bidders to win control of lithium-ion battery maker A123 Systems, |46| which filed for bankruptcy in 2012. The Chinese company's $257 million bid enabled it to take control of the commercial parts of A123 Systems after the Committee on Foreign Investment in the United States (CFIUS) approved. |47| The deal initially raised questions in Congress because A123 Systems was awarded $249 million in stimulus funding in 2009. |48| At the time of the transaction, Wanxiang already had bought other U.S. auto parts companies and had over 3,000 U.S. employees. incentives for production and sale of energy-saving vehicles, which could help reduce dependence on imported oil, cut emissions, and usher in a significant rise in technological knowledge that would benefit the indigenous vehicle sector. As discussed later in this report, the Obama Administration has notified China that it will take these and other subsidy issues to the WTO if the Chinese government does not modify its policies. A typical automobile is made from upwards of 15,000 parts, from engines and transmissions down to tiny electronic sensors, dashboard components, tires, and windshield wiper motors. While vehicle manufacturers at one time made nearly all these parts, major automakers now buy from parts suppliers as much as 70% of the value added in production of motor vehicles. A large network of independent producers is responsible for designing and producing these parts used by the automakers and integrating parts into more complex assemblies, such as a complete dashboard or steering mechanism. There are several types of parts manufacturers. Tier 1 manufacturers make components and systems for new vehicles. They often use parts furnished by Tier 2 and 3 suppliers, smaller companies that may focus on particular types of products, such as gaskets or valves. While Tier 2 and 3 suppliers sometimes sell directly to automakers, in many cases their main customers are the repair shops and auto supply stores that make up the aftermarket. Tier 2 and 3 suppliers often sell into the new vehicle market through the Tier 1 suppliers, which use their parts in larger assemblies, rather than through direct relationships with automakers. Many Tier 1 manufacturers also build for the aftermarket. Of the total U.S. parts market, an estimated 70% of the value originates with Tier 1 suppliers. The shift to global platforms is driving consolidation among suppliers, for two reasons. Auto manufacturers will want to use the same components on a given platform regardless of where the vehicle is assembled, so they prefer to deal with parts makers that can supply them worldwide rather than only in certain locations. Also, the automakers commonly ask the larger Tier 1 suppliers to furnish entire systems, such as seating or braking systems, requiring the suppliers to maintain sophisticated design and engineering operations and to handle procurement of the simpler parts used in their products. The implications for the use of Chinese auto parts in the new platforms hinge on the ability of Chinese auto parts companies to expand their horizons in two ways. First, Chinese parts makers are seeking to increase the quality of their production so it is attractive to global automakers. Second, they likely will seek to become not just makers of individual parts, but also systems integrators, so they can make the complex assemblies that automakers now expect their suppliers to provide. Ultimately, the Chinese government is seeking to develop vehicles that will be built in China and exported more widely to other markets, as the Japanese and Koreans did earlier. Volkswagen already produces parts in China with its partner SAIC Motor, and exports those Chinese wheel hub assemblies to other countries. |60| The combination of automakers building only a few platforms and rising Chinese auto and auto parts quality and sophistication could coincide to spur exports of more parts and eventually vehicles from China. The other side of industry globalization is the growth of U.S. firms abroad. As foreign-based parts makers were expanding in the United States, many of the U.S.-based parts makers were setting up operations in growing Asian markets, especially China, to serve their Detroit 3 customers that were building cars there. In some cases, according to a Department of Commerce report, they did so because "the Detroit 3 also advocated that U.S.-based suppliers move production to lower cost countries or risk losing future contracts." |62| General Motors is the largest non-Chinese automaker in China and obtains about a quarter of its annual revenues there, |63| so supplying GM's manufacturing in China from a local base became an economic imperative for many of the Tier 1 suppliers. But the auto parts makers also saw the opportunities arising from growing Chinese auto production. Data on exports and imports show that the U.S. trade pattern in auto parts is shifting, with imports from traditional trading partners (such as Canada and Japan) leveling out while the growth in parts imports is being sourced increasingly from Mexico, China, and Germany, as shown in Table 2. While the United States' overall value of imported parts has increased by 96% in the past decade, import growth from Mexico, China, and Germany exceeds that average, with Chinese imports growing by more than 700%, albeit from a very small base in 2001. U.S.-made parts exports to Mexico rose 103% in the past decade, double the rise in U.S. parts exports overall. The North American Free trade Agreement (NAFTA), which created a fully integrated market for autos and parts made in the United States, Canada, and Mexico, has led to increasing investment by foreign automakers in Mexico. |65| U.S. exports to Canada and Germany also rose, but from a smaller base in 2001. U.S. parts exports to China rose by more than 400% (also from a small base), thus making China the fastest-growing market for U.S. parts exports. U.S. Department of Commerce, http://www.trade.gov/mas/manufacturing/OAAI/build/groups/public/@tg_oaai/documents/webcontent7tg_oaai_003765.pdf. Autos and auto parts have been the subject of a number of trade disputes between the United States and China. All of these disputes have arisen since December 2001, when China was admitted to the WTO. While China has repealed overt pre-WTO regulations favoring its domestic industry over imports, several parts of the 12th Five-Year Plan have generated charges that China is violating some of its WTO obligations in its support for the industry. Export performance requirements facing foreign investors in the automotive sector have also been irritants. U.S.-based Cooper Tire & Rubber, for example, reportedly won approval for investment in China after agreeing to export 100% of its tires for five years. Similarly, Honda has reportedly been allowed to own 65% of an assembly plant in Guangzhou because it agreed to export all of that plant's production. |73| Such requirements can exacerbate trade frictions, as the companies may have incentives to substitute Chinese exports for U.S. production in order to meet the conditions of their investments in China. A 2005 report by the American Chamber of Commerce in China (AmCham) stated that China had met or improved its compliance of its WTO obligations in several important auto policy areas, including tariff reduction, quota elimination, distribution, and auto financing. However, the report went on to state that several problems remained. For example, it stated that intellectual property violations (e.g., counterfeit auto parts and design patent and trademark infringement) were common and continued to grow. The report further charged that a 2005 regulation, "Measures on the Management of Parts Import Constituting an Entire Automobile," attempted to discourage firms in China from importing auto parts. The measure required auto manufacturers in China to pay complete built-up vehicle tariffs (25%) on imported parts used to assemble vehicles in China if the assembled vehicles included a certain level (threshold) of imported parts. The Chinese tariff on auto parts at the time was 10%. |74| Manufacturers in China were further affected by requirements by the government to maintain and submit records of their auto parts imports. But the Chinese action comes after lengthy negotiations during which automakers have moved production to China on a very large scale anyway. Foreign automakers with assembly plants in China have largely stopped using imported auto parts, partly to avoid paying the steep taxes on these parts and partly because international auto parts manufacturers have moved production to China. On April 24, 2009, the U.S. International Trade Commission (USITC) initiated an investigation |79| of certain types of light vehicle passenger tires, based on a petition filed by the United Steelworkers International Union (USW), which contended that U.S. imports of passenger vehicle and light truck tires from China caused or threatened to cause market disruption to U.S. domestic producers of like or directly competitive products. In June 2009, the USITC announced that it had determined such imports did in fact cause or threaten to cause market disruption, and recommended the imposition of additional tariffs over three years (55% in the first year, 45% in the second, and 35% in the third) and to provide expedited consideration of Trade Adjustment Assistance for firms and/or workers who are affected by such imports. China called the imposition of increased U.S. tariffs on Chinese tires protectionist, and responded by initiating a WTO trade dispute settlement case against the United States on September 14, 2009. The WTO ruled that U.S. actions did not violate U.S. WTO commitments. On November 11, 2009, shortly after imposition of the U.S. safeguard measures on tires, China launched antidumping and countervailing cases against U.S. autos (as well as poultry). In December 2011, China imposed anti-dumping duties (ranging from 2.0% to 21.5%) and countervailing duties (ranging from 6.2% to 12.9%) on American-produced cars and SUVs over two years. The United States charged that the action was unjustified because Chinese authorities did not objectively examine the evidence as to whether certain U.S. policies to support the U.S. auto industry caused injury to China's domestic industries. On July 5, 2012, the United States initiated a WTO dispute settlement case against China, calling the imposition of duties on American-made automobiles "yet another abuse of trade remedies by China." A WTO dispute panel was named in February 2013, but no action has been taken on the U.S. complaint. On March 13, 2012, the United States, Japan, and the European Union jointly initiated a WTO dispute settlement case against China's restrictive policies on rare earths (as well as on tungsten and molybdenum). This case was brought shortly after the United States prevailed in a similar WTO case brought against China over its export restrictions on nine raw materials. |88| The WTO has not ruled on the rare earths case. The United States and China held consultations in November 2012, but the case is unresolved at this time. confirmed that foreign-invested enterprises are eligible on an equal basis for subsidies or other preferential policies for NEVs with Chinese enterprises, and that these subsidies and preference programs will be implemented in a manner consistent with WTO rules; and that China affirmed that as it develops possible future NEV support programs, the views of all stakeholders will be considered, including the comments and opinions of the United States. However, these pledges have not alleviated the concerns. In 2012, USTR's National Trade Estimate Report on Foreign Trade Barriers continued to cite industry concerns over China's policies regarding NEVs. Ten years ago, the Chinese auto industry was in its infancy, with a very low level of production and sales, few imports or exports, and vehicles whose quality was not up to par with cars and trucks produced in countries with larger and more sophisticated auto industries. The recession that hit the United States, Japan, and Europe did not affect China's economy so severely. As vehicle production and sales lagged in Europe, North America, and Japan, they expanded dramatically in China, more than doubling from 2009 to 2012. No other nation's auto industry has seen such robust growth in the past decade. China's growing middle class increasingly values car and truck ownership and, with a population of more than 1.3 billion, there is room for significant expansion of the Chinese auto market even after its recent growth spurt. China has not excluded foreign automakers from establishing a presence there, but they must be minority or 50/50 partners with Chinese firms, many of which are owned by provincial and municipal governments. Parts makers, on the other hand, are permitted to own a majority share of operations in China. It appears clear from China's Five-Year Plans that building up the size and quality of the auto assembly and auto parts industries is a very high national priority. Moreover, China's long-term plan--its feasibility as yet untested--is to leapfrog over gasoline-powered internal combustion engine technology into new energy vehicles, such as electric and fuel-cell-powered cars. Nearly all major foreign automakers are participating in the Chinese market. The Chinese government welcomes their role in expanding its domestic industry. Similarly, the Chinese embrace investments by foreign parts makers, which build parts there to service the automakers from their home countries. The Chinese government's plan to consolidate auto and parts makers could in the future result in greater competition for U.S., European, and Japanese firms, which now have a decided edge over the fragmented Chinese domestic industry. However, Chinese state intervention in the auto and auto parts industries could limit the benefits for non-Chinese manufacturers relative to what would occur under more open markets and trade. When China joined the WTO in 2001, it appeared to signal that it was on a path toward accelerating its transition to a market economy. However, USTR has noted that since 2006, there has been a "troubling trend in China toward intensified state intervention," and that China seems to be "embracing state capitalism more strongly." |98| At a November 2011 WTO review of China's WTO compliance, the U.S. representative stated that the auto sector was one sector that the U.S. highlighted as having been particularly plagued by government intervention. In addition to the commercial opportunities presented by the Chinese market, there have also been growing pains in the U.S.-China motor vehicle trade relationship. A half-dozen trade disputes have developed in the past 12 years, many resulting in WTO rulings and changes in Chinese laws and regulations affecting the motor vehicle industry. When Japanese auto companies began to export extensively to the United States in the 1980s and 1990s, many in Congress argued that Japanese auto policies were unfair, and legislation was introduced to limit imports of Japanese cars. This pressure led Japanese auto firms to restrain auto exports to the United States and to build U.S. auto plants. So far, China is exporting auto parts and not automobiles to the United States. Growing Chinese investment in the U.S. auto and auto parts industry could alleviate concerns over increased U.S. imports of automotive products from China as long as such commercial activity is not seen as unfair under U.S. trade laws or WTO rules. A key factor in the growth of the Chinese auto industry will be how well it can generate and sustain its own innovations, which regularly mark the growth of the auto industry everywhere in the world. Consolidation without innovation and home-grown technology applications may leave the indigenous Chinese auto and parts makers reliant on foreign joint ventures. Farmington Hills, MI $5.1 Lear Corp. Source: Automotive News, "Top 150 OEM Parts Suppliers to North America," 1999, and "Top 100 suppliers to North America, 201 1." Notes: The companies shown are the largest Tier 1 suppliers; revenues shown are based on each company's sales of original equipment parts. Companies shown in bold type had their headquarters outside the United States. This document has been published on 22May13 by the Equipo Nizkor and Derechos Human Rights. In accordance with Title 17 U.S.C. Section 107, this material is distributed without profit to those who have expressed a prior interest in receiving the included information for research and educational purposes.